Start off by lightly sketching a basic circle as a starting point using an HB pencil. Sketch in basic guidelines for facial feature placement. Sketch in basic shapes for the eyes and cheeks. Develop the eyes then sketch in the nose and bottom jaw. Sketch in the ears and add guidelines for the neck/body. Erase unnecessary guidelines and develop the outlines some more. Using 6B woodless graphite or any soft, dark pencil, very lightly crosshatch over the drawing. Use a blending stump or paper towel to smooth out the background shading then lightly smooth over the caracal. Avoid over-blending; the outlines should still be visible. Use an eraser to add basic highlights to the caracal and background. Sharpenable eraser work best for this step. 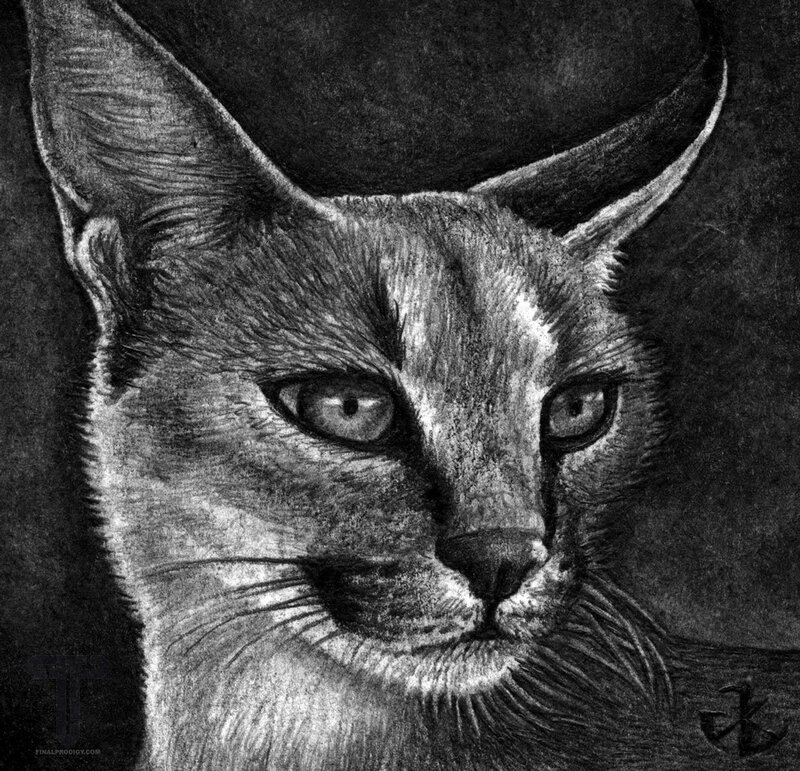 Use a soft pencil (6B-3B), to add basic dark shading to the caracal's features. Use a hard pencil (2H-4H) to add light shading to the eyes. Use a softer pencil (3B-B) to build up the dark shading of the eyes. Be sure to keep the reflection over the eyes as white as possible. Use an HB pencil to roughly develop the fur below the eyes as well as the shading of the cheeks. Use a softer pencil (3B-B) to draw in the whiskers and build up the dark shading of the nose, mouth and cheeks. Use a 2H pencil define the outline of the left ear and start developing the fur in and around the ears. Use an HB pencil define the fur before using a softer pencil (3B-B) to define the shadows/darker shading. Use a 2H pencil to define the outline of the right ear at well as the fur on top of the head. Use a soft pencil (3B-B) to build up the dark shading of the ear. Use an HB pencil to begin adding fur shading to the face. Pay attention to the flow of the fur and use very quick, short strokes to emulate hair. Keep adding more layers of fur until more natural and full. Use an HB pencil to roughly shade in the neck and body fur. Start building up the background shading. Spreading graphite powder with a blending stump is the quickest way to develop the shading however lightly crosshatching with a soft (9B-6B) pencil would also work. Add another layer of even darker shading before using a blending stump to smooth out the background shading. Start adding final details. Use a 2H pencil for the lightest details, HB for darker details, and a soft pencil (7B-3B) for the darkest shading. Start at the top left ear. Be sure to sharpen the outline around the ears and develop the fur. Develop the shading of the right ear as well as the forehead fur. Try to work from top to bottom. Add more detail to the eyes as needed. Finish up by developing the whiskers and muzzle fur as well as the neck and body fur. Use an eraser to clean up highlight and a blending stump to smooth over any shading that seems too rough.